Houseboat hire Gold Coast, Tweed River houseboats, gold coast houseboats, houseboat hire gold coast broadwater, QLD, houseboat rental Gold Coast and Tumbulgum NSW. House boat holidays in Australia. Tweed River houseboat hire, Gold Coast houseboats for hire, Yamba - Clarence River house boat hire, Houseboat holidays New South Wales and Queensland, Australia. Houseboat holidays are a great idea for a family holiday. Get out on the water for a complete change. Change the scenery with every step, while maintaining all the comforts of home! 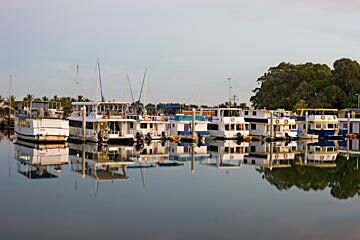 With a number of operators to choose from, you can explore the Gold Coast broadwater, visit quaint riverside villages on the Tweed, and watch Mount Warning loom closer as you meander upstream toward Murwillumbah, or cruise the mighty Clarence as it winds its way from Grafton to the sea at Yamba. These are self drive boat charters, so no licence is required, but a pre departure briefing on handling and waterways regulations, is included with all hires. Houseboat holiday hire on the Gold Coast broadwater QLD, Tweed river, Tweed Heads Northern Rivers, NSW, and south on the Clarence river region of Australia are listed below. Please note that no house boat rentals currently operate in Byron Bay or Ballina to our knowledge. There are some boat charter operators, but those are primarily off shore fishing charters. When you contact businesses listed here, please mention that you found them via Big Volcano. Thanks. Check out other Australian houseboat holidays and river boat holiday locations below, including houseboat hire in New South Wales (NSW), South Australia (SA) and the Northern Territory (NT). Some operators are very popular, so you'll need to book well in advance to secure your holiday boat. Disclosure: Please note that these are affiliate links and we get a commission if you make a booking and complete your stay. The links open in a new tab or window. See our full affiliate disclosure here. Check availability and book* selected houseboat holiday options below via booking.com. Colo River Houseboat is located in Lower Portland, north of Sydney. Guests staying on this rustic houseboat holiday home have access to a fully equipped kitchen. It also has a satellite flat-screen TV, air conditioning and a living room. With a separate bedroom area and sofabed in the lounge area, it sleeps up to 5 people, making it suitable for couples and young families. Penrith is 39 km, Gosford is 46 km, and Kingsford Smith Airport is 65 km. On the banks of the Murray River in New South Wales, Mildura Houseboats offers air-conditioned, luxury houseboat accommodation. Some houseboats feature a hot tub and a fully equipped kitchen. Choose from three and four bedroom 6, 8 and 12 berth houseboats, suitable for families and groups. Free on-site boat and campervan parking. 5-minute drive from Mildura town centre. Situated in Moama, New South Wales, Moama on Murray Houseboats provides accommodation with a kitchen. There is a seating and a dining area in all houseboats. Ideal to discover the area, and drop a line in for some fishing. 2 berth, 4 berth and 10 berth houseboats available. Echuca is 2.7 km from Moama on Murray Houseboats. Situated in Marrakai in the Northern Territory, Mary River Houseboats come with a balcony, a kitchen with a fridge and a stovetop, and a private bathroom. 4 berth and 6 berth boats are suitable for a family or two couples. Ideal for fishing holidays and to discover the tropical north of Australia. Darwin International Airport is 89 km. Very popular. You'll need to book well in advance. Houseboat Rental SA is located in Mannum, South Australia. Choose from 6 berth and 10 berth houseboats, with full apartment style facilities, plus hot tub and BBQ facilities on the deck. Pets are also allowed! Adelaide Airport is 67 km away.